The Culligan Hand Held Shower Filter with Massage (HSH-C135) is a shower filter that reduces chlorine and other contaminants from your shower water. 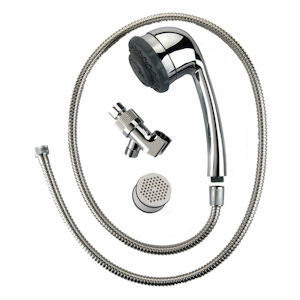 This hand held shower head water filter installs on any standard 1/2" threaded shower arm. 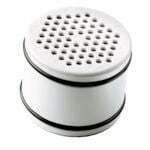 This hand held Culligan shower filter (HSH-C135) comes packaged with the Culligan WHR-140 shower head replacement filter cartridge (which reduces chlorine, scale, rust, sediment, the odor of sulfur, and other impurities from your shower water), as well as a 5 foot stainless steel shower hose and 1 mounting bracket (no tools required). The package also includes Teflon tape and a water filter cartridge change reminder sticker. This Culligan hand held shower head filter features Level 2 Extra Filtration and reduces chlorine (99% reduction), scale, rust, sediment, the odor of sulfur, and other impurities from your shower water. 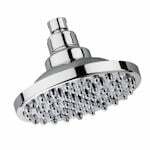 Recent studies have shown that chlorine in shower water is a major health concern. People absorb more chlorine in the shower than they do when drinking chlorinated water. Excess chlorine in your shower water can cause dry and irritated skin, acne, hair dryness and damage, as well as other health problems in many people. The use of this shower filter will leave your skin and hair feeling softer and cleaner due to its removal of excess chlorine as it helps to protect you and your family from the dangers associated with too much chlorine and other impurities. The KDF filter media is more advanced when compared with standard carbon filters because of the bacteriostatic feature of this particular shower filter. The KDF shower filter cartridge included with this product is a bacteriostatic filter that inhibits bacteria from passing through or growing on the shower filter cartridge, as recent research has demonstrated that many shower heads often harbor harmful varieties of bacteria. This genuine Culligan shower filter was tested and certified by NSF International to meet NSF / ANSI Standard 177 for the reduction of free available chlorine. 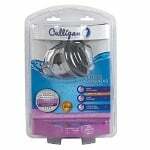 Get Culligan water treatment without calling the Culligan man!